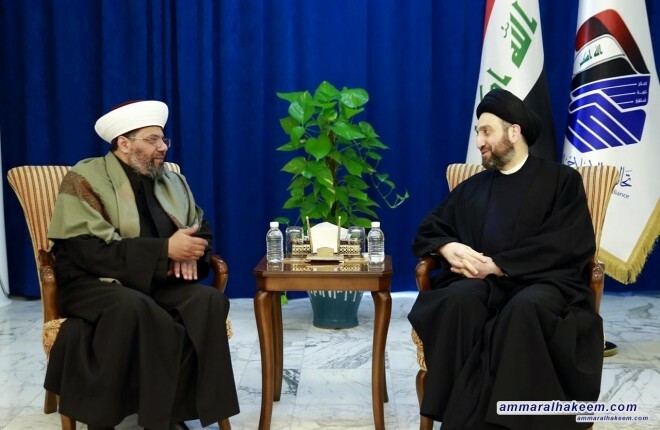 Head of the Reform and Reconstruction Alliance, Sayyid Ammar al-Hakim, in his office in Baghdad, received a delegation imams and orators of Anbar mosques under the chairmanship of Dr. Jalal al-Kubaisi Thursday 31/1/2019. His eminence shouldered imams and orators the responsibility of promoting tolerance and moderation, and towards society to prevent the return of terrorist Daesh and its subversive ideology. His eminence indicated the political changes in Iraq, including elections and assigning independent personage to run the country, and the nature of alliances that are national rather than ethnic and sectarian, stressed to support these changes for being best means to end the political crises in Iraq and achieve political stability that will lead to social, service and economic stability. His eminence stressed to support the government in its service and development course of action, emphasized that the priorities of the current phase are services, job opportunities and combating corruption, indicated that the interest of Iraq and Iraqis lies in positive neutrality away from the policy of axes and that Iraq becomes a place for meeting not for intersecting. His eminence pointed out that the post-Daesh remedies need development and economic plans, stressed that the moderate religious discourse is one of the most important solutions which is a joint responsibility among all political, social, religious and cultural sides.